Delicious fresh pineapple is so easy to put up and can your own pineapple pieces. It can be canned in a simple sugar syrup, or venture out and try it in this brown sugar and rum syrup. Wonderful served warm over ice-cream or plain pound cake, or as an accompaniment to grilled pork, chicken or baked ham. Yummmy! Cut pineapple, removing core and eyes, cubing pieces. In a small sauce pan combine brown sugar, water and rum and heat to boiling. Add pineapple pieces and simmer 5 minutes. 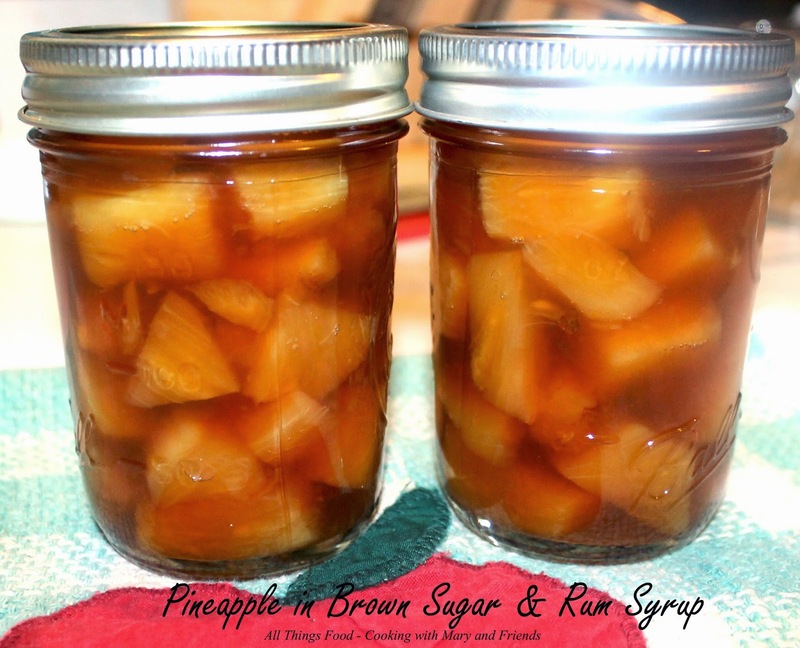 Spoon pineapple pieces into two (2) eight-ounce canning jars and ladle sauce over all, removing air bubbles and leaving 1/4-inch head-space. Remove jars from boiling water bath and allow jars to cool on a dish towel on top of your kitchen counter undisturbed for 24 hours.